You’ve probably experienced it before. You give it all at the gym with a “go hard or go home” mindset. Then you wake up the next day, stiff as a board and feeling like you’ve been hit by a train. What gives? Starting a new exercise routine or amping up your current intensity often leads to soreness a day or two after you workout. Muscle fibers tear down and begin swelling within 24 hours of a workout. Often times, exercise-related injury occurs during this period of muscle recovery because you’re body is weakened. When you’re compensating your sore muscles, you’re more likely to end up straining something else. Although painful and bothersome, the only way to build up stronger muscles, is to break them down first. The good news is that you can lessen the pain with these tips. Don’t skip the warm-up. If you’re coming into the gym and hitting the heavy weights or cardio machines right off the bat, you’re setting yourself up for a sore tomorrow! Give yourself a 5 - 10 minute warm up period to loosen muscles and joints before you begin. Say hello to H2O. Staying properly hydrated is vital to keeping your muscles from seizing up. Often times muscle cramps can be greatly lessened with a good amount of water. 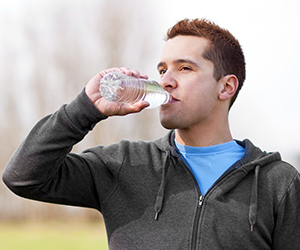 Keep water nearby while you’re exercising, and chug it after you leave the gym. A is for aminos. Amino acids are little powerhouse proteins that your body uses for muscle development and recovery, in particular L-glutamine. Make sure you’re consuming adequate amounts of protein, in either free form or by the food you eat. Three words. Stretch, stretch, stretch! Nothing helps in the fight against sore muscles better than a good, quality stretch session after your workout. Using a foam roller is a great tool for loosening muscles. Know thy limits. We love seeing folks taking their fitness seriously. But being “serious” about your health doesn’t mean you have to exhaust yourself at the gym every time. Easing into a workout routine is always the best approach. For those who have an established routine, mix up your week with 3 days of strength training and 2 days of cardio and 1-2 days of a stretching routine like yoga.